Watch an episode of The Walking Dead, a show that claims to be about zombies, and you’ll see a show that’s suspiciously absent of zombies. On the other hand, watch 13 Assassins and you’ll get plenty of samurai in extreme gritty mud-caked realism – it is a movie that isn’t pandering to various demographics to net a bigger audience. The last 45 minutes of this two hour movie is an epic fight scene. One of the world’s most prolific directors, averaging four to five movies a year, Takashi Miike’s mastery of cinema is tempered by his desire to not only fearlessly tackle any genre but also to pay respect to great works that came before him in said genres. 13 Assassins serves as a kind of looking glass into previous Jidaigeki masterpieces such as Seven Samurai. There are very few artifices here and only one (usually there are an abundance) signature over-the-top Miike moment, but it does not detract from the story, instead propelling the plot to its reasonable conclusion. What you get is a politically charged, well-oiled samurai film that is filled with intrigue and plenty of swordplay while still staying grounded and showing the rich culture of ancient Japan. The film’s plot is simple and perfectly encapsulated in the title. It takes place in 19th century Japan during a period of relative peace when the samurai class is in its twilight. The 13 assassins are a motley crew of old timers, gamblers, newbies and ronin, each depicting aspects of a class of society that is waning and no longer needed. The samurai band together to take down the sadist younger brother of the shogun, who is next in line to rule the shogunate. The last 45 minutes of this two hour movie is an epic fight scene. It just doesn’t stop. I was giggling as each scene was set up and the fighting ensued in a constant stream. 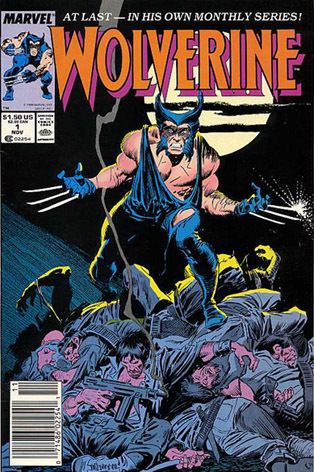 It was like looking at a samurai version of the cover of Wolverine #1. The gritty realism also comes into play here since fight scenes in samurai films are usually bloodless; here we see people hacked in two and there are just buckets of blood. It is a gore-fest, but in a very realistic way – nothing too crazy happens. Well, one thing, but I’ll let you see that for yourself. I have some minor criticisms. There is one scene featuring computer generated effects that are really lacking. It might have been a budget or timing issue, but the scene isn’t blocked out really well. There is also one jarring, art house camera moment that takes you out of the film. However, both incidents are over quickly and the carnage quickly ensues. 13 Assassins comes out in theaters April 29, thanks to Magnolia Pictures. I highly recommend it to anybody who wants a straight up badass samurai movie. If you can’t stomach it, then have fun watching Hoodwinked Too! Hood vs. Evil. George Collazo’s favorite movie of all time is Ghost Dog, he’ll tweet your ear off about it. Follow him @georgecollazo.